Schedules and timelines are the most important aspects of any project. And there are always some painful consequences whenever the project fails to deliver as per the schedule. Project over-runs can cost more than just money. However, the simple practice of establishing project milestones can keep the project running on schedule and can ensure timely delivery of deliverables. And the best tool for planning, communicating and implementing milestones is the milestones report. You can download the sample report and follow along with the explanations to learn how to best use such a document to your project's benefit. 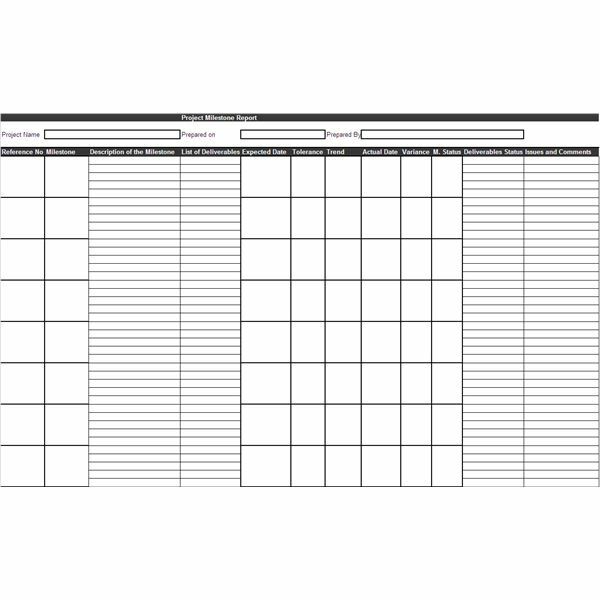 Before you can fill in the information into the template, you’ll need to identify the milestones for your project, and write down the deliverables and the expected date for each of them. Once this information is in place, you’re ready to prepare the milestones report. Here are some details on the information that must be included in this report. Each milestone should be assigned a unique reference number which will make it easier for future references. Here, you need to write a short name for the milestone like – procurement of machinery or installation of water heater etc. This name should be short but descriptive enough to give the reader a fair idea of what this milestone is all about. The detailed description of each milestone should clearly summarize all the things that must be completed to successfully achieve the milestone. A detailed list of all the deliverables, which are due at the completion of a milestone, should be mentioned along side the respective milestone. This is the tentative date by which the milestone should be achieved. This is the number of days or weeks by which a milestone can be delayed without causing and damage to the overall project. This is meant to show how things are progressing towards achieving the milestone as per specifications. Terms like progressing, lagging, derailed etc can be used to show the trend. This is the actual date on which a milestone is achieved. The variance is calculated as the difference between the actual date and the expected date. This is where the current status, i.e. whether the milestone is delayed, achieved or in progress, can be shown. Here the status for each of the deliverables, associated with the milestone, can be shown. This last column of the project milestones report is meant for either writing the final comments if the milestone has been achieved or to detail out the issues that have delayed or hindered the achievement of the milestone. The milestone report will need to be updated periodically and fresh copies of this report should be circulated to all concerned people, as and when information is edited or updated on this report.